New Live Map Feature Helping Clients Visualize Data | Wildlife Computers Inc. The new live map feature is delighting clients around the world. We are continually adding features including a flashing icon to indicate an active tag and the ability to hover over a location to see additional details. 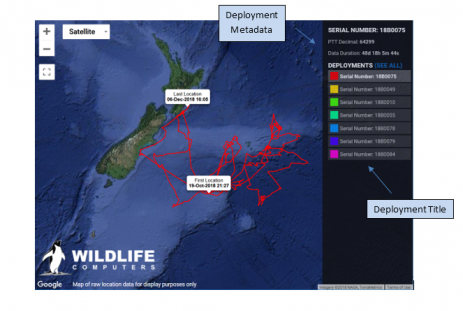 Mote Marine Laboratory & Aquarium posted a great example of the live map feature on their sea turtle tracking website: https://mote.org/sea-turtle-tracking. The male loggerhead sea turtle map shows you how you can dig into the map and see the different turtle tracks from the SPOT-375. The live map feature allows users to create custom live maps that can be easily embedded into a website. The map feature is intended for display purposes only, and not for scientific presentation. You can create a new map, choose which display tracks or location points to include, and deployment start and end dates. You then get an embed code that automatically updates the data on the web page. For more information, read the Portal and Tag Agent User Guide.